Ramsons, also known as Wild Garlic smells of garlic and onions, they have white flowers and in some areas it replaces bluebells and so in the Spring, the field layer of the woods is white not blue. Ramsons are a relative of Chives and not so closely related to Garlic. 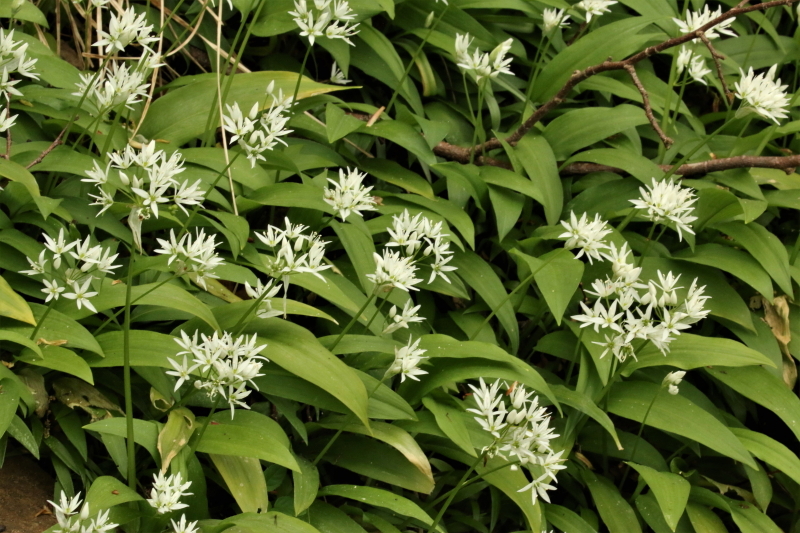 The scientific name Allium ursinum has a reference to Bears because they are quite partial to the bulbs and will dig them up in order to eat them as will wild boar which perhaps accounts for the contrast between the Forest of Dean where I live along with the wild boar and here Ramsons are less often seen. Whereas in the Wye valley they are very common and wild boar are less often encountered. Recently (18/05/2018) I was in some woods just behind where I live, which is Clearwell, Gloucestershire, and this is on the very border of the official limit of the Forest of Dean, I saw a large group of wild boar. This wood has lots of Ramsons growing in it along with Toothwort Pignut and some Bluebells, anyway I was photographing a Ladys Smock plant which had an egg of the Orange Tip butterfly on it when I was disturbed by about 10 wild boar. I had not seen them before in this wood, but obviously they are extending their range so maybe in the future Ramsons will disappear from these woods. A. ursinum is widespread across most of Europe. It grows in deciduous woodlands with moist soils, preferring slightly acidic conditions. In the British Isles, colonies are frequently associated with bluebells, especially in ancient woodland. It is considered to be an ancient woodland indicator species. The plant is edible and can be used in soups. A good recipe is to boil some potatoes and a generous bunch of ramsons leaves and then to drain off excess water, add some stock, chicken stock is good, and blend until it is all broken down and a thick tasty soup is achieved. It has been used in Switzerland to feed cattle and thus obtain a garlic flavoured milk which is converted into a tasty butter. Probably not so good as milk with your cornflakes or in your coffee !! Below is a photo taken at the end of May when the flowers are over and the seeds are developing. This is another flower which has tepals not separate sepals and petals. It has six of them and they make a star like arrangement. The plant is fertile and produces seeds which is the main way of propagation. Thus it can spread quicker than some woodland species.